It is a classic speed trap. Only a few yards lie between two signs marking the decline from 35 to 25 mph. Just a couple of seconds earlier I was traveling a benign five miles over the limit, but the next moment bordering on reckless driving. 40 in a 25. The first speeding ticket I have ever received; 29 years with a clean record. The officer almost seemed reluctant to issue it, apologetic. I thanked him as we finished up our business, instantly thinking how ludicrous it sounded. But then, I realized I was grateful to him for the lesson he was there to remind me of. My husband and I agreed on what we wanted for our family, a quieter, more simple life and a strong connection to our children. Once again, I assumed I could beat the clock, defy nature. I did not leave myself enough time to get to an appointment and wasn’t present enough to register the speed limit sign. I am habitually late. I have heard the adage that when one is late, that person assumes his or her time is more valuable than of the one waiting. I, in no way, believe that about my time. I simply try to squeeze in one more task until I leave myself the minimum amount of time to travel. It is my bad habit. And ironically, it goes against everything I try to do in life. When not hurried, I am calm and observant. When rushed, I am living in the future and mentally smacking myself for not planning better, for not being able to control my day more efficiently; I am my own worst enemy. I come from a long line of worriers. My tendencies towards fretting and trying to control any situation is encoded in my DNA. While I have always wanted to be the laid-back, go-with-flow type, it is not my default. So I dive into yoga, meditation, inspirational books and blogs that help me to learn a different way. Becoming a parent only exacerbated my tendencies, so choosing to live a more simple, intentional family life is my way of trying to control the environment; finally in a way that benefits us all. I was initially drawn to a more simplistic lifestyle in my twenties. I went to college in a small, culturally-oriented town where evidence of simple living was abundantly visible. Authentic restaurants offered easy, fresh food. Farmer’s markets in parking lots and little ladies selling flower bouquets on street corners were common. Small movie theaters and wood-paneled, cozy book stores offered inexpensive entertainment and lecturers. The music scene drew a vast and talented collection despite the town’s size. I felt so at home in the energy of that town among like-minded students and locals. When I was pulled to leave upon graduation I found myself trying to replicate that feeling elsewhere. In our more carefree years of youth we are more in harmony with the natural rhythms of the earth. Finding the peace of presence is much easier and innate before responsibilities, obligations and expectations of adult life occupy our minds. My chosen career often involved long hours, an intense pace and occurred in a large, busy city. As my husband and I planned for a family, the high energy of my life felt incongruent with what I valued. I felt out of balance and my health was suffering. I chose to reduce my work hours and listened closely to the needs of my body and mind. After the birth of our first child we moved away from our large city to a smaller one closer to family. My husband and I agreed on what we wanted for our family, a quieter, more simple life and a strong connection to our children. But as our family grew and both of our children started school, new demands on our time emerged, threatening the lifestyle we dreamed of for our family. When you join an elementary school community there is an onslaught of volunteer opportunities; committees, fundraisers, events and classroom tasks. It is easy to interpret helping out in school as helping our children and in some ways it is. Schools could not function well without the help of parents, but this network works best when the tasks are balanced by the many. Sadly there seem to be a regular band of people on which everyone depends that serve almost as professional volunteers. This new volunteer profession is enticing. When a parent chooses to stay at home to raise a family there is no longer a job evaluation. There is no pay raise, no pat on the back for a job well done, no accomplishments of completing projects. In no way do these facts diminish the importance of our work as parents, but the lure of proving our intellectual worth comes again when committees need officers or events need organizing. It is easy to lose ourselves in the lives of our children. But when this outside pull begins to affect the balance of a family, the intention of our actions needs to be reevaluated. I see clearly in myself and in the faces and temperaments of my children when our schedule has tipped the scales. When this happens, my husband and I begin to bicker or keep score or we may have trouble sleeping. My children lose their resiliency, melting down over a math problem or a lost pen. My daughter becomes anxious and my son acts as if he had a pot of coffee. I find the more full my personal schedule, the more I try to control every aspect of my day bordering on obsessive compulsion, my way of pushing back anxiety. Even though we make a gallant effort as a family to not over-schedule ourselves, to not sign up for every activity or camp, to balance busy days with quiet ones, it is a great challenge to erect a fortress to keep the high-pace of the world out. There is a fine line to walk between feeling the needs of a slower life for our family and the real responsibility of contributing to our community. It takes a persistent and keen eye to recognize what we should say yes to and why, and vice versa. Is saying yes to this request for my time contributing to the health and well-being of my family? Or is it the need to prove myself worthy, to get that yearned for pat on the back? When we chose to strive for a simpler life as new parents, we could never have imagined the gale force of pressure to join the momentum of endless distractions offered to families. In our choosing to protect our time together as a family at home, we find the time to engage in the day-to-day activities we value, that strengthen our connection to each other and the earth. In choosing gardening together or strawberry picking, instead of just buying everything we eat at the supermarket, we have our own food to cook together, we teach our children about the food system and teach them a new skill. In cooking together rather than eating in the car on the way to dance lessons, we find time to sit together at the table to share a meal and a discussion. In gathering neighborhood kids for a pickup baseball game instead of going to baseball practice a half hour away, our children learn negotiation and compromise and learn not to be afraid to try and maybe even fail. In choosing a school that does not require hours of nightly homework we have time for bedtime stories and long, therapeutic sessions of family snuggling. Living this way takes effort. Simple does not mean easy. But for us, simple means self-sufficiency, purpose, slowing down to a speed that gives us enough time and reserves to enjoy each other. While opportunities to choose the convenient path abound, with us even succumbing at times, we want to teach our children the pleasure and satisfaction of making or growing things for ourselves, and to interpret the caring of a home and family as sacred. This way of life does not exist without pushback. Living in an urban setting and having work and a school culture that pours us into mainstream life daily, contradiction to our values is something we must consistently navigate, and it does not happen without fear. If you break away from the pack, are you still welcome? We have chosen to raise our family in a way that is not the norm but at the same time must weave in and out of it. We do what we can, we weave our values into modern culture, stepping in and out of two different worlds. My son’s Pokemon cards are in a hand sewn and hand embroidered pouch. My daughter eats her homemade lunch with her cloth napkin at school while reading off her Kindle. A cell phone accompanies us on a long nature walk in the forest, because my husband is on call. Our family strives to slow down our lives, to honor each moment, soaking up its goodness and its gift. It takes daily effort to fight the pull all around us. Productivity, to do more, faster, is so alluring. We live in a culture of instant gratification. From high-speed internet service, to researching a subject on a phone at a stoplight (which in the past would have required a trip to the library), to entitled drivers honking at slower cars to clear a path. Tolerance for patience has diminished in our culture with the need for instant results being applied to multiple facets of life. To live slowly, intentionally, takes diligence and reminders. I recently bought a honey pot. 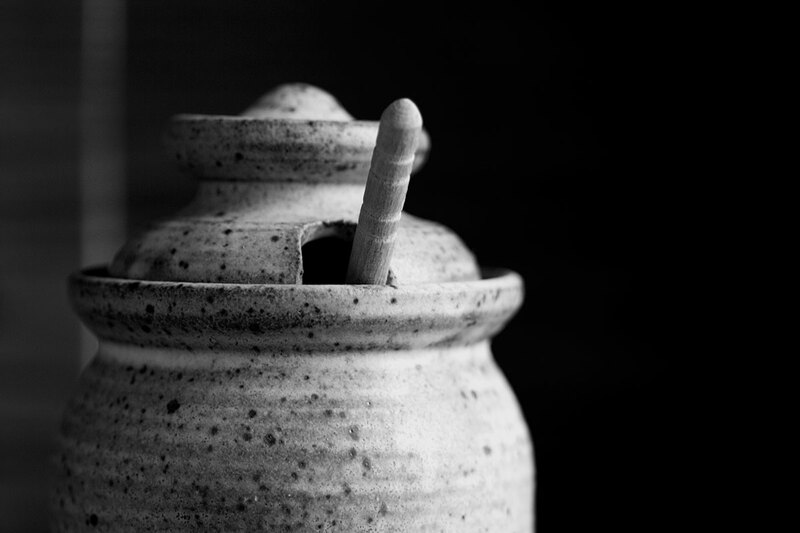 It is beautiful, hand-spun pottery from a local craftsman. Another unexpected thank you. I fill it with honey from our Shenandoah Valley and drizzle some out each morning on my homemade yogurt. Mornings can be fast-paced as we juggle lunches, school papers, toothbrushes, bed covers and it is easy to rush out with our thoughts toward the day ahead. The honey drops down from the dipper slowly, making curly-q’s and swirling patterns. It takes its time. It is a string on my finger. The honey reminds me to stop and breathe, to take in the beautiful scenery of my family’s life together. Hopefully my right foot is listening.